J. B. Michaels, a member of the Society of Children’s Book Writers and Illustrators, has written stories since he was in fourth grade. He is a history teacher who loves his job. JB Michaels' sequel, The Tannenbaum Tailors and the Brethren of the Saints, builds upon the previous story, taking the characters to a new level of adventure. Relishing the victory of saving Santa’s magical Snowball, Captain Brendan’s Tannenbaum Tailors crew enjoys Christmas Day with Jack. Yet, Brendan is uneasy, something feels wrong. As the team watches Jack play with his miniature bullet train, unwelcome guests fly from the train - termites! Yikes! While conducting an investigation of the train, Brendan suddenly vanishes. The team searches for answers – what is the connection between the termites and Brendan’s disappearance? Among the branches of Jack’s tree the Spiritless lurk, setting traps for the crew. This is just the beginning of a race against time. The crew repeatedly finds themselves facing desperate and impossible situations. Seeds of doubt are planted, their hope is challenged – could the Spiritless really be hiding among them? The Spiritless are relentless. They have a plan, a wicked strategy to invade and conquer the North Pole. Led by a mysterious black-bearded man, they will not stop until they have destroyed Christmas forever. Mysterious and magical, JB Michaels tailors his narrative with the same meticulousness the Tailors use to care for their trees. Each word is thoughtfully chosen, each chapter builds upon the other, creating a glimmering story of adventure. “Year Zero” provides an enticing narrative hook. It is a mystifying and auspicious beginning that propels a lasting promise of hope later revealed in the story’s plot. Michaels is beyond imaginative; he takes the reader into a realm of marvel and wonder. The story is spunky, witty, humorous and filled with endless action. There is never a dull moment. It contains surprising, precisely timed turns of events which heighten the suspense. Furthermore, inspiring truths are woven into the fabric of the plot; forgiveness, the power of love to conquer evil, the resolve to fight when all seems lost, the true meaning of family and the importance of remembering and honoring the sacrifice of others. As a firm believer of keeping Christ in Christmas, I admired the referencing of the biblical message and the depiction of prayer by the characters. The explosion of light piercing the darkness and releasing healing leaves an unforgettable and lingering impression. Miracles do happen. After all, isn’t that what Christmas is all about? 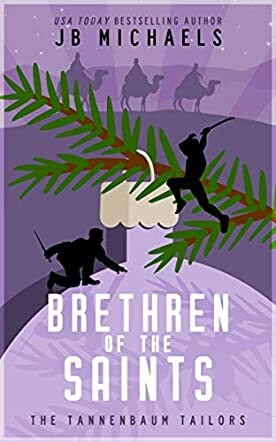 The Tannenbaum Tailors and the Brethren of the Saints, Volume 2 is an action and adventure novel for children and preteens written by J.B. Michaels. Captain Brendan Holly and the rest of his team of Tailors were enjoying a well-deserved respite from the pre-Christmas onslaught of the Spiritless elves, who were determined to stop Santa and destroy Christmas forever. Nothing untoward had happened on Christmas Day, and the team of tiny tree elves was enjoying that incredible mix of exhaustion, joy and satisfaction that feels so good on Christmas night. One of Jack's presents was incredibly tempting to some of those tired elves, however; it was the bullet train that their 12-year-old human friend had received. Steve, the Fire Tailor, for one, wanted desperately to take the train out for a ride; then Billy, Irene and Tonto got in on the action. They used their Glimmerlifts to help them hold on to the train as it sped around the track. Then suddenly a window near Steve and Tonto shattered, and then another. As the alarmed elves considered their next move, they watched, horror-struck, as hordes of giant insects flew out of the broken windows. Each insect, seen from the Tailors' perspective, was about the size of a small dog, and there seemed to be hundreds. So much for a relaxing Christmas night -- things were going crazy once again. J.B. Michaels' Christmas-themed action and adventure novel for children and preteens, The Tannenbaum Tailors and the Brethren of the Saints, Volume 2, finds the diminutive tree elves once again battling the forces of evil in the form of elves intent on destroying Christmas. While the author gives just enough background information for this novel to be read on its own, I highly recommend starting with the first book in the series, The Tannenbaum Tailors and the Secret Snowball. In that first volume, Michaels fully develops his characters, their occupations as Tannenbaum Tailors, and the plot details the first major attack of the Spiritless elves. In this second volume, the battle becomes an epic struggle with hordes of insects, further complicating what should have been a well-earned rest after the Christmas season. Michaels elevates his characters to epic-hero size, no matter how tiny their actual footprints on the world, and their feats of bravery and daring make this action-packed and exciting novel well worth reading - no matter what your age or whether you ever did believe in Santa or Christmas. The Tannenbaum Tailors and the Brethren of the Saints, Volume 2 is most highly recommended. The Tannenbaum Tailors and the Brethren of the Saints Volume 2 by JB Michaels is a children’s action adventure book in a series that will appeal most to an audience made up primarily of children, though some parents might find it amusing as well. The Tannenbaum Tailors and the Brethren of the Saints Volume 2 follows Jack, Jack’s family, the Tailors, the Spiritless, and Captain Brendan as the Spiritless attempt to ruin the magic of Christmas by getting Jack to tell people about the Tailors. The Tannenbaum Tailors and the Brethren of the Saints Volume 2 by JB Michaels is definitely meant to be read after reading book one in the series, however, I was able to understand the main points of the story quickly without too many problems. The Tannenbaum Tailors and the Brethren of the Saints Volume 2 will truly pull children in with its wondrous characters and plot. I liked the idea of the Tailors and the Spiritless; it made for an interesting story line. I think my favorite character, however, would have to be Jack. I just enjoyed how he kept fighting the good fight to try to protect the magic of Christmas against the Spiritless, even when all hope seemed lost. I hope that The Tannenbaum Tailors and the Brethren of the Saints Volume 2 by JB Michaels is not the last book in the series as I believe that children would truly enjoy more books.